And at the awards ceremony held in London in November, Ballure Bridge won Project of the year under 50m Euro award. ‘The bridge was a very significant project for us that we achieved on time and on budget, which took a tremendous team effort. It helps secure the safe operation of the MER for the future. ‘I’m pleased the work was completed on time and within budget despite being undertaken during the winter months in order to start MER services as scheduled on 20th March this year. It is wonderful recognition for the whole team to receive this accolade. 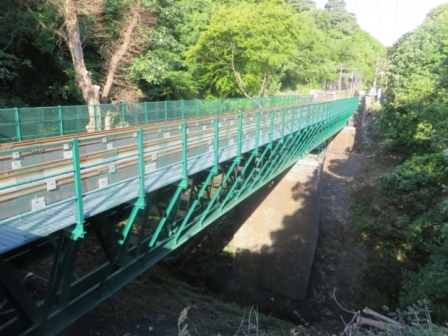 “ We were delighted to be selected as the preferred Grit Blasting & Painting Contractor on this project, which we believe stems from an excellent relationship with IOM Government which has grown over many years. The trust in this relationship has seen us deliver several “quality and on budget” major projects on the Island. The biggest challenges we faced were mainly caused by the amount of sailings that were cancelled due to the rough seas that are encountered through the Winter months, delaying vital supplies reaching us on time. However, through our Supervisors and Painters willing attitude, many long days were endured to ensure we met the programme. The award gives us great satisfaction and is a testament that anything is possible when there is a will to succeed.